Adapted from a 2008 released English film, “Front of the Class”, which is based on Brad Cohen’s book “Front of the Class: How Tourette Syndrome Made Me the Teacher I Never Had”, director Sidharth P. Malhotra’s “Hichki” is a feel good, emotionally packed and inspirational film. It is the touching story of Naina Mathur, a young girl who would not let Tourette Syndrome keep her from doing what she loved most; teaching. Despite her speech defect, she sets out to become a teacher. Tourette syndrome is a neuropsychiatric disorder which sets off multiple motor tics which include compulsive throat-clearing, knee knocking, violent muscle twitches and piercing barks. These tics are beyond one’s control. While the exact cause that sets off these tics is not known, it is believed to involve a combination of genetic and environmental factors. Rani Mukerji as the plucky Naina Mathur is flawless. She portrays her character with sincerity. This simply tells you how persevering she is. The film reveals how as a student she was expelled from twelve schools before finally being accepted whole heartedly at St. Notker’s High School. The same school later accepts her as a teacher, mid-term, not because of her brilliant academic credentials but because of a crisis situation. She is hired to teach a class of underprivileged, reluctant misfits. How she wins everyone’s hearts, forms the crux of the tale. The film is packed with dramatic moments that are as truthful as they are inspiring. Every scene resonates with sentiments. With apt metaphors and lingo, the writing is simple and straightforward. And while the film intends on communicating life-affirming values, there are moments in the first half that seem forced. The second half, despite the painstakingly moralistic notes, touches the right chords. You get so immersed with the characters especially Naina. You feel sorry for her when despite her sincere efforts, her class gets suspended, for no fault of theirs. What elevates the film is the brilliant performances by the supporting cast. You can relate with every character as each one of them is well-etched. The ones that stand out apart from the gang of students are Sachin and Supriya Pilgaonkar as Naina’s estranged parents, Ivan Rodrigues as the School Principal, Neeraj Kabi as Naina’s colleague at school who is keen to dismiss Naina’s students from the school and of course the character who plays Naina’s brother. 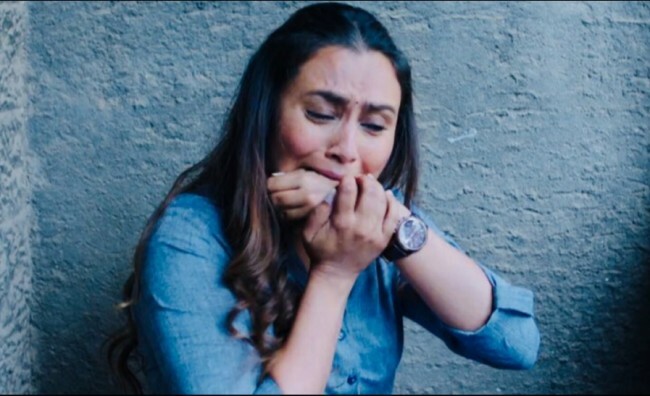 Overall, “Hichki” remains in your mental space long after you leave the theatre.